In the 21st century, nuclear power has been identified as a viable alternative to traditional energy sources to stem global climate change, and condemned as risky to human health and environmentally irresponsible. 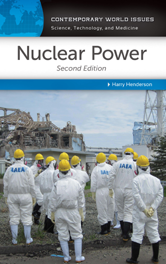 Do the advantages of nuclear energy outweigh the risks, especially in light of the meltdown at the Fukushima plant in 2011? This guide provides both a comprehensive overview of this critical and controversial technology, presenting reference tools that include important facts and statistics, biographical profiles, a chronology, and a glossary. It covers major controversies and proposed solutions in detail and contains contributions by experts and important stakeholders that provide invaluable perspective on the topic. How Much Does Nuclear Power Cost? Background: What Is Nuclear Energy?